While on holiday in Hampshire we frequently passed this set of barns. Eventually I took the opportunity to drive into the courtyard. The barns were built in 1850 using bricks from Burlesden Brick Works which is now a museum. 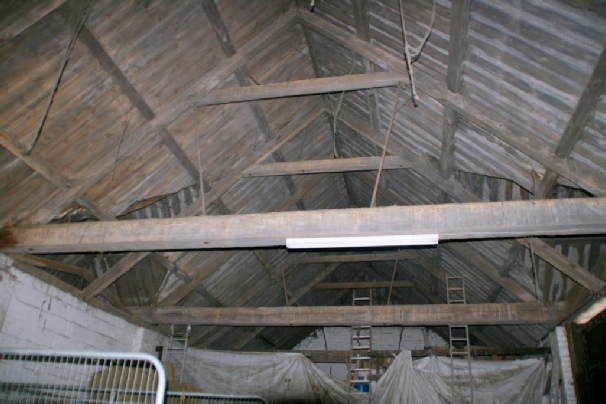 The trusses appear to be soft wood. This replaced oak during the ninteenth century.Built in the last part of the High Farming period they were obsolescent soon after the Second World War. During the War they were used to assemble the wings of Spitfires and there are gun emplacements in the barns to attest to their strategic importance. After the war they fell into disrepair and were restored by the current owner. Although he installed various partitions, they are all removable so that the original structure remains intact. Map or Godwick Manor and Deserted Medieval Village. Hill Farm Barn - C.O.A.M.